Throughout the month WCTV will air “¡Vida!” on Thursdays at 9 p.m. on WETV Channel 20. “¡Vida!” features IU East World Languages and Cultures faculty discussing Latino life in Indiana and beyond. The Day of the Dead Altar Building Competition will be held at 12:30 p.m. on Thursday, October 8, in the Campus Library Atrium. Members of the campus are invited to contribute photos of loved ones. Spanish classes will present their altars and speak about Day of the Dead via the Hispanicampus gallery project. The campus will vote for their favorite altar. IU East will partner with Morrisson-Reeves Library for a second altar building event at 2 p.m. on Saturday, October 24. The event is open to community. Author and poet Marjorie Agosín will visit campus Monday, October 12, and Tuesday, October 13. Agosín’s visit to IU East is sponsored by a PBS Latinos grant, Mindful Explorations, courtesy of the William H. and Jean R. Reller Endowment, IU East Diversity grant, and the School of Humanities and Social Sciences. On Oct. 12, Agosín will give an open talk from 4-5 p.m. in the Campus Library, located in Hayes Hall. The talk is free and open to the community. On Oct. 13, Agosín will visit the Early College program at Richmond High School. She also will lead an Arpillera Workshop (Chilean life-story quilts) for IU East students in the Campus Library from 2:30-5 p.m. Students may register for the workshop at http://iueast-arpilleras.eventbrite.com​. Agosín was raised in Chile, the daughter of Jewish parents. Agosín recieved a bachelor’s degree from the University of Georgia and her master’s and doctorate from Indiana University. In both her scholarship and her creative work, she focuses on social justice, feminism, and remembrance. Agosín is the author of numerous works of poetry, fiction, and literary criticism. Her collections include The Angel of Memory, The Alphabet in My Hands: A Writing Life, Always from Somewhere Else: A Memoir of my Chilean Jewish Father, An Absence of Shadows, Melodious Women, Starry Night: Poems, and A Cross and a Star: Memoirs of a Jewish Girl in Chile. Agosín has received numerous honors and awards for her writing and work as a human rights activist, including a Jeanette Rankin Award in Human Rights and a United Nations Leadership Award for Human Rights. The Chilean government honored her with a Gabriela Mistral Medal for Lifetime Achievement. Agosín is the Luella LaMer Slaner Professor in Latin American studies and a professor of Spanish at Wellesley College. In addition, the “Latino Americans: 500 Years of History,” a public programming initiative produced by the National Endowment for the Humanities (NEH) & the American Library Association, is part of an NEH initiative, “The Common Good: The Humanities in the Public Square” film series that will be offered through IU East now through March 2016. The films begin at 5:30 p.m. and are held at the IU East Campus Library, located in Hayes Hall, or Morrisson-Reeves Library in Richmond. Refreshments are served. Films are free and open to the public. The next film in the series, Empire of Dreams, will be held Thursday, October 15, at IU East in the library. 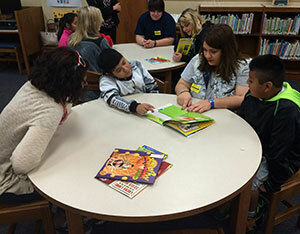 Earlier this September, IU East Spanish students visited Richmond elementary schools for Huevos verdes y jamon (Bilingual Storytelling) September 15-16 as part of a joint venture with the Campus Library and literacy movements. Students read books to the elementary students and speak about Hispanic Heritage Month. Thursday, October 8: Day of the Dead Altar Building Competition, Campus Library Atrium, Hayes Hall, 12:30 p.m.
Monday, October 12: Author and poet Marjorie Agosin visit and open lecture, 4-5 p.m. in Hayes Hall Campus Library. Supported by PBS Latinos grant, Mindful Explorations and Diversity Committee. Tuesday, October 13: Marjorie Agosin to visit the Early College program at Richmond High School. Arpillera Workshop for IU East students in the Campus Library from 2:30-5 p.m.
Saturday, October 24: IU East and Morrisson-Reeves Library altar building event at 2 p.m. The event is open to community. September 24 to October 15: “¡Vida!” will air Thursdays at 9 p.m. on WETV Channel 20. Films begin at 5:30 p.m. Refreshments served. Arpillera Workshop Campus Library Day of the Dead Altar Building Competition Hispanic Heritage Month Latino Americans 500 Years of History Marjorie Agosín School of Humanities and Social Sciences World Languages and Cultures ¡Vida!